Starring: Matilda Anna Ingrid Lutz, Alex Roe, Johnny Galecki, Vincent D’Onofrio, and more. It is sequelllllll time! Twelve years after the less than successful sequel of ‘The Ring’ was released and fifteen years after the American original ‘The Ring’ was released, we now have another sequel that has brought a shred of hope in Ring lovers as the trailers have generated a decent response from film fans. 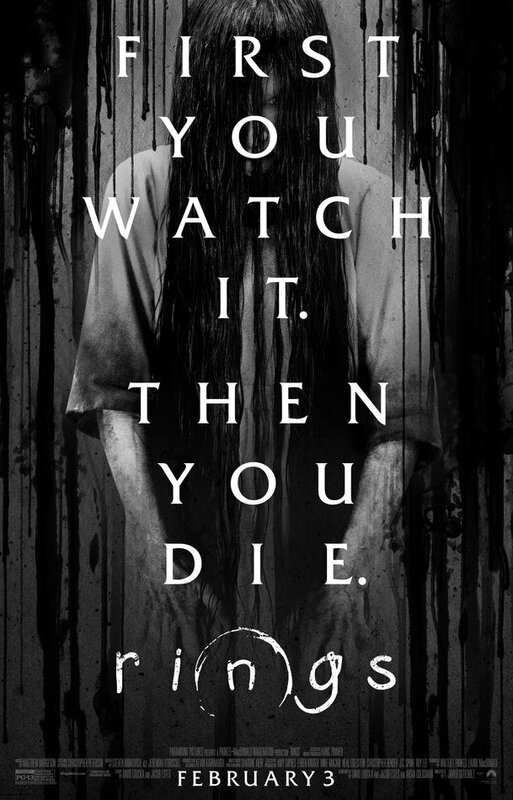 So how does another installment in The Ring series fare against an Oberrated review? Well, time to find out! As a mysterious video happens to be viewed by the eyes of a young woman named Julia (Matilda Lutz). She must use the visions she is seeing after watching the video to her advantage and figure out the mystery of the video before she dies in seven days. So, it was not as bad as I anticipated but it was frustrating in its own right. I am going to break this down into the good and the bad. The Good: The story kept me curious. It developed well and was not half as terrible as 90% of the horror movies that come out in this day and age. For the sake of having a half decent story compared to others, it gets an alright rating as is for that alone… The reasoning for the spreading of the video is intricate and creative to me. To others it may be seen as ridiculous or outrageous but hear me out. If interested, a spoiler section will be far at the bottom of this review. The Bad: Most everything else. The acting was poor. The early acts were interrupted and changed to a different scene on multiple occasions before a full thought could even be put together. That is like me breaking down a movie but then jus…. The characters have zero regard to law, law practically does not exist in this film as they desecrate graves, break into buildings, interrupt meetings, and so on, yet absolutely nothing happens to them… I am not a fan of recycled material and this film recycles a lot. From elements that were used in the first and second Rings as well as material that was used in other horror/thriller films made from ’05 to now. Similar to my overall feeling and review of ‘Morgan’, ‘Rings’ gets the same treatment. So in comparison to the plethora of horrid horror films, this was not as bad as them but by no means is this a hidden gem for the genre. Worth a watch, but if you have any hesitation, you will not be missing much. Ok, welcome back, so the reasoning to spreading the video. Galecki’s character, Gabriel, is a professor who stumbles upon the video because he collects vintage electronics. Upon finding the tape and watching it himself, he begins a research experiment on it and the story of Samara. He realizes that he must make copies of the video, have someone else watch it, then he/that person becomes safe. The only issue I have with this concept is how did he come to that conclusion? Did he have someone else die originally after watching it prior to Skye, then figured out he had to create a “tail”? Maybe it was his girlfriend since we never saw her again after the early act of the film. Regardless, this is an intricate and creative point because from Samara’s perspective, she is cursing these people but ultimately just giving the people she curses seven days to figure out her mystery and “put her soul to rest”. And if they do not, they die. Gabriel continued these tails, kept them safe by finding people to watch the videos and spread it while he continued his research, trying to solve the mystery of Samara. Ultimately falling upon Julia, which for whatever reason, she had stronger visions than others have, but she was able to use the visions and figure the mystery out. I am not a fan of the unexplained reasoning behind Julia having the stronger visions but as for the reasoning for spreading the video and sparing the one who spread it, it is pretty creative. If you have any input or want to have a conversation, I would love to hear the input! Posted in 2017 Movies, Movie Review.Tagged Alex Roe, F. Javier Gutiérrez, Johnny Galecki, Matilda Anna Ingrid Lutz, Rings, The Ring.